Jonathan Roson was resident in March-May 2014 and returned for an exhibition in August-September 2015. From 28th of July until 25th of August 2017 several of the works in marble can be seen at the DreamSpace Gallery (3 Dufferin Street, London, EC1Y 8NA). Jonathan Roson is an emerging artist, born in Sydney, Australia, currently living and working in London, UK. He has exhibited and undertaken artist residencies in Australia, United Kingdom, Canada and Portugal. In May 2014 he completed an artistic residency at Foundation OBRAS, Evoramonte. He created sculptural objects (using marble found in the Estremoz quarries), installations (using iron from an abandoned rail line) and site-specific works (by cutting patterns in the tall grass of open fields around the centre). The slideshow and video below provides an impression of his 2014 residency. Foundation OBRAS and Direcção Regional de Cultura do Alentejo invited Jonathan to come back in August 2015 and undertake his second artistic residency at OBRAS. As part of his new art residency, Jonathan created several site specific installations inside Evoramonte Castle, relating the art work to the history of the castle and surrounding area of Evoramonte. The title of this exhibition: WIRED, refers to an installation made up of hundreds of wild oat stalks "floating" in the space. Currently Jonathan is living and working in London. He still works with marble of Estremoz. A recent project is making small sculptures (20x18cm) entitled 'Ideograms, Hirigana series'. Jonathan Roson's work is represented by DreamSpace Gallery (3 Dufferin Street, London, EC1Y 8NA). Solid Harvest was an exhibition and open studio by Jonathan Roson held on the 3rd & 4th of May 2014, at the Centre of Foundation OBRAS (Herdada da Marmeleira, Evoramonte, Portugal). 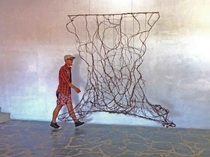 Throughout his art residency Jonathan created sculptural objects and installations. An interventionist he creates works by using locally sourced materials and site-specific works (marble waste from Estremoz quarries, iron from an abandoned rail line and patterns cut in the open fields around the centre). The exhibition Solid Harvest investigated the meaning of things as they appear in our experience. It triggered the viewers to be aware of their own perceptual awareness and their direct response to the works.